Strap in and engage mad-fast horse racing commentary mode. We’ve a load to get through and a stupidly short amount of time to do it. 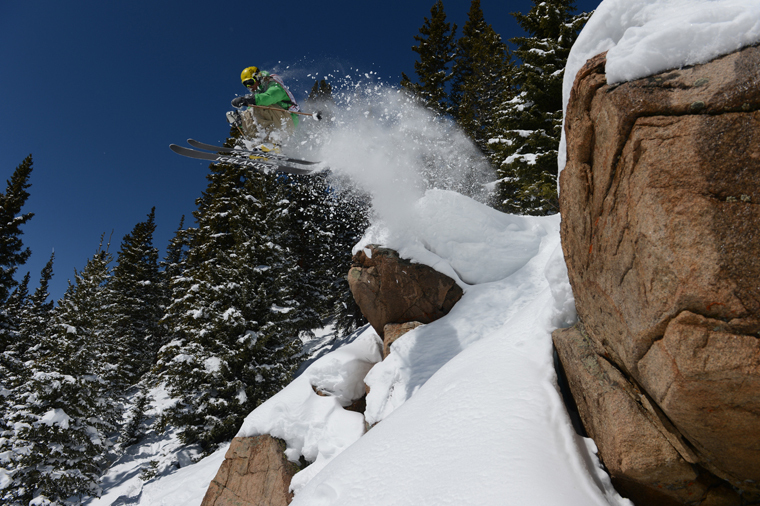 Even less terrain than A-Basin, but don’t let that stop you. The Aspens here are close to perfect, and because it’s all boulder fields, there’s often a mini pillow fest between the tree alleys. Let skis run, engage crazed Tanner Hall mode and there’s no better place on earth. Take that snowy Niseko! Take that awesome Jackson! Kapow! Yes, only four lifts; yes only 40 short runs; yes a pain to get to compared to Colo’s other gems being at the far end of the I-70 corridor out from Denver. But hell, I had fun here. Like Powderhorn 90 minutes west, it’s a tiddler (470 acres) but again more than worth it for fantastic trees (see last month’s Little Hills review). I’d have it a fraction behind its hillbilly neighbour due to a flat spot that has to be boosted up top, but skiers’ left of Primo and Beaujolais are glade-tastic. Sundown area is a steep banger too. They’ve also got my favourite ski shop/service grotto on earth. Think magnificently-bearded ski gurus, shagged-out leather sofas for boot fitting and Seth Morisson graffiti quotes all over the walls (he’s a Summit County local). Brilliantly cheap too, like all of Colo’s eight gem resorts, with a four-man condo at the base just $120 per night midweek. The shoestring love-in continues up the road past Eagle and Minturn, with cat skiing for under $300 a day (including beacons/rockered rentals if you need them). I spent a day researching a load of operators last season and didn’t find anywhere that came close. Until recently, Copper was the only mountain (in the world we think) offering free cat skiing. But neighbour Loveland is now in on the action too. Just sign a quick waiver at the base, and boost up the north side of the 13,000-ft ridge. Yes, it’s only a five or six minute ride, but hike from the drop for double diamond Marmot, more extreme Rock Chutes, or snap straight into your bindings for Tickler over the knuckle which is like some brilliant mini Alaskan end of the world face at 40° as the slope falls away. Even four days after the last snowfall, it was shin-deep superb. The rest of the mountain is strong too. Definitely nail the South Chutes under Chair 9, then get your hike on for Porcupine. Loads of powder too (420-inch average), making it second only to Wolf Creek on the state’s snowy list. Just 25 miles from Denver, and near brilliant Boulder (packed with ace bars and food; stay at the Boulderado). Salto, Brian’s and Jolly Jug glades are highlights, and despite the cover being spruce rather than aspens (due to the altitude) you’ll have a lot of fun. The snow was blown/icy on my visit but I’d be very happy raging under the Corona quad in pow for, oh, some days. Never-groomed Upper Diamond you’ll like too, if you can handle yourself. Enjoy bumps and you best do Psychopath, just up from the main base. The name says it all. I was knackered after lots of miles (ski and car), but I think I may have done a little happy dance at the bottom and shouted: again, again! Pretty much how I feel about all these small but mighty gems – a very nice surprise. Colorado has eight gem resorts. Monarch and Ski Granby Ranch, we so wanted to tag you too, and complete the set, but ran out of time and fresh ski socks on our 850-mile road trip.